New, more powerful and advanced features endowed with digital SLR Nikon D750. Although it is the smallest and lightest digital SLR from Nikon workshops, we can look forward to the presence of the image sensor FX format, which in this class of devices brings new possibilities. Not only avid photographers and literally opened the gates to higher levels of photography. FX format CMOS sensor capable in low light photo capture with outstanding levels of detail and high dynamic range while maintaining low noise levels. With a resolution of 24 megapixels and support for professional RAW images captured offering tremendous scope for further processing and treatment including printing in large formats. The newly designed 24.3MP FX-format CMOS sensor works in close collaboration with the EXPEED 4 image processor to produce rich image quality with a low level of noise and accentuated by a notable sensitivity to a native ISO 12800, which is further expandable to ISO 51200. The Nikon D750 enables users to capture RAW format files which in turn allows for myriad editing possibilities, including large format printing. Nikon’s new image processor Expeed 4 easily manages data-laden images with superior speed and accuracy, including video recordings in FULL HD. Expeed 4 also boosts the camera’s overall performance for extraordinary results, expands your ISO sensitivity range for greater flexibility. You can expect magnificent results with suppressed noise levels, even in difficult lighting conditions. The D750 uses Nikon’s Advanced Multi-CAM 3500II Automatic Focus sensor module to provide photographers even more refined focus point. The in-built 91,000px RGB metering sensor, combined with an advanced face detection and spot-metering linked to the AF point, carefully analyses each scene with surprisingly accurate results. Enhancement of the already impressive Image Sensor comes in the form of a built-in HDR shooting mode that produces low-noise pictures upon which can be applied a wide range of Picture Control profiles to refine the colour and tonal handling of images. Shoot uncompromised full-resolution images at up to 6.5 fps in both FX and DX formats and capture fast-moving objects with incredible flexibility at full resolution. The D750 offers numerous shutter release modes, such as the quiet continuous shutter release and the quiet continuous release. A built-in stereo microphone captures crisp and clear audio. However, if it does not specifically match your shooting requirements, you can choose to use any of the external microphones available to you. The Nikon D750 offers various image sharing and data transfer technologies and makes the natural process of sharing photography extremely easy and efficient. It comes with a conveniently built-in Wi-Fi. Simply download the free Nikon Wireless Mobile Utility app onto your compatible electronic device. All you have to do is to share your impressive photos is to use the app to upload them directly to your mobile device. In combination with a bright, pentaprism optical finder, the camera offers a 100% frame coverage and the incorporated organic EL display system clearly displays shooting information for seamless adjustment without the need to remove your eye from the viewfinder. The included EN-EL15 rechargeable lithium-ion battery pack provides up to approximately 1230 shots or up to 55 minutes of recording per charge. Other major features that make the D750 an indispensable tool are an excellent display and design. A large 3.2“ LCD monitor features a tilting design so you can benefit from working with the high and low angles. In addition, the screen features an RGBW colour array to enhance visibility in bright conditions. It can also be custom colour balanced to match additional external monitors. 3.2 " (8.13 cm) Done! USB 2.0 interface, WiFi wireless interface Done! DPOF (Digital Print Order format), PictBridge Done! Accumulator, Strap, Manual, Power cord / adapter, Body cap Done! For shipping to other EU countries visit this page Nikon D750. Chcete doručit zboží do Česka? Prohlédněte si Nikon D750 tělo. Chcete doručiť tovar na Slovensko? 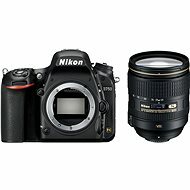 Prezrite si Nikon D750. Magyarországra történő kiszállításért tekintse meg ezt a termékoldalt: Nikon D750.